While I love the fantasy element of Wild West Exodus, there is something about a genuine Wild West game that always gets me interested. 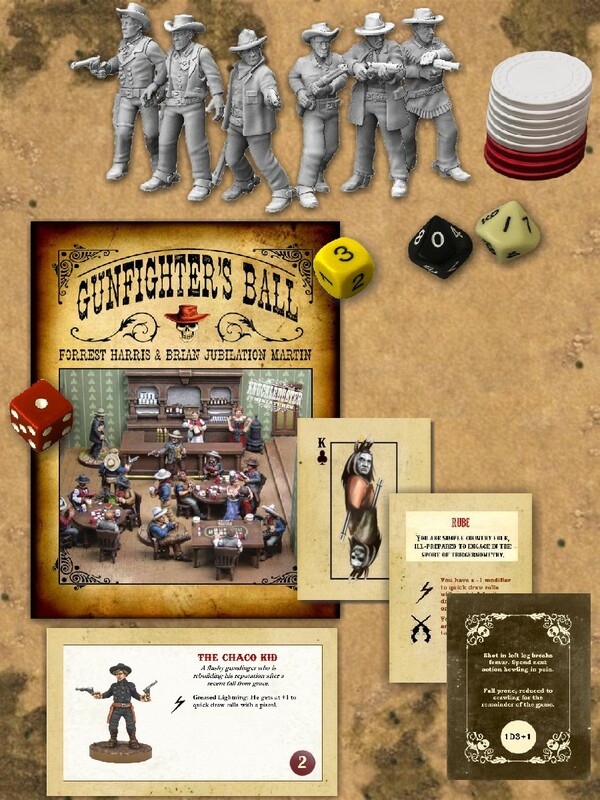 Gunfighters Ball is a new game from Knuckleduster Miniatures, and having seen the excellent models advertised in Military Wargames and Wargames Illustrated over the past few months, I was pleased to see a full on game was coming out. Today is the launch day for the game from the press release below, so fingers crossed I can get one soon. 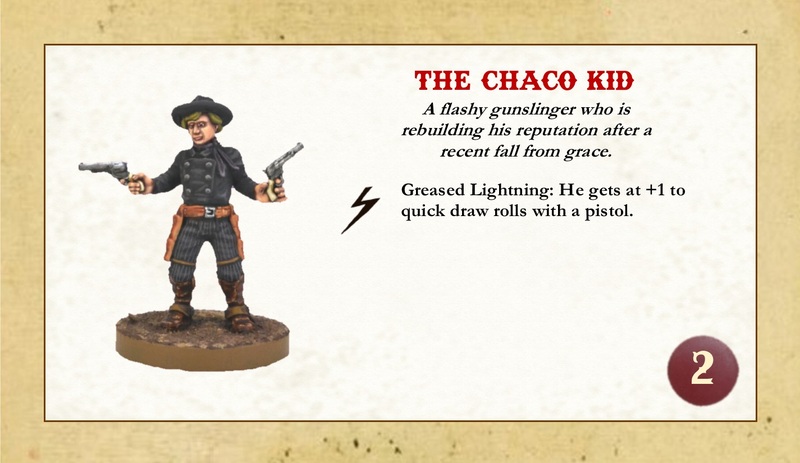 Gunfighter’s Ball, Knuckleduster’ new tabletop western miniatures game is wrapping up its Kickstarter fulfillment and the long-awaited release of the system has been set for December 15th, just in time for Christmas. The release will include a full-color, hardbound rulebook, four decks of playing cards used in the game, a game mat, a new saloon buildings, two new furniture sets (including a large saloon bar), as well as 31 new figures in addition to the 57 fighters, 33 bystanders, and numerous buildings, animals, and mounted figures currently available. If you’re already in-the-know, you can probably stop here. If you’ve never encountered this game before, please read-on and find out about the game your friends are (no doubt) telling you about! Gunfighter’s Ball is a very fast-paced and character-driven shootout game with card-based initiative, an innovative wound-tracking system that uses poker chips, and a very simple and easy-to-use defensive reaction mechanism that gives non-phasing players a chance to shoot back when being attacked from short range. This game stands on the shoulders of Wild West games that have gone before it, however this game will feel at once as comfortable as an old pair of boots, and shiny as a new pair of spurs. WHAT MAKES THIS WILD WEST GAME UNIQUE? Several things make Gunfighter’s Ball stand out. First is its scope. 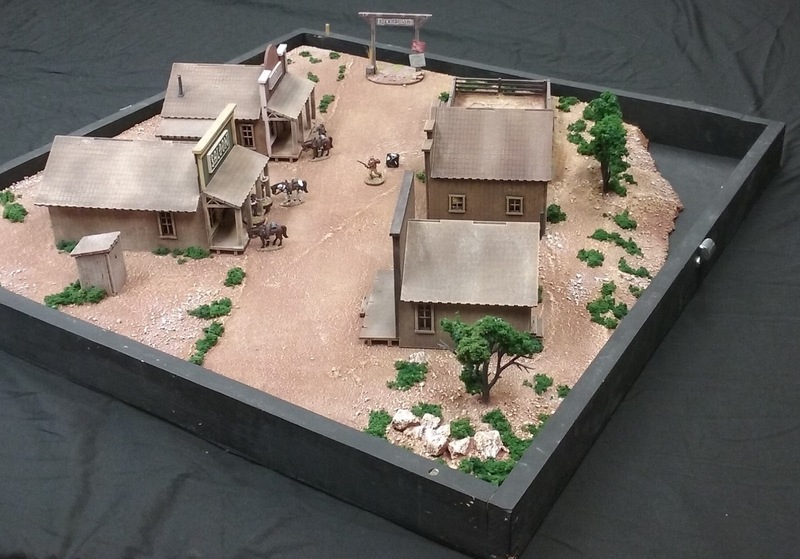 The game was designed to recreate gunfights the size of the Tombstone shootout at the OK Corral; in other words, gunfights and NOT small military skirmishes with cowboys masquerading as assault troops. For this reason, you can think of it as “crime gaming” and not “wargaming”. Second is the use of cards to add flavor without the need to keep track of lots of details. Special ability cards, called Pistoleer Cards, can be used to give a character advantages, disadvantages, or quirks. 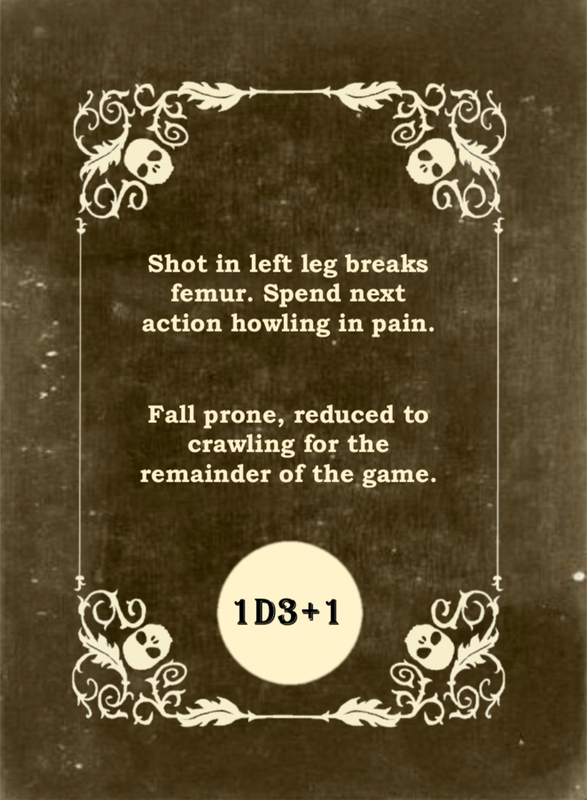 Wound cards from “The Black Deck” can be used in lieu of the wound chart to add some gruesome fun to the hit results. Third is the use of poker chips to keep track of health; Knuckleduster sells casino-grade clay composite poker chips that make a distinctively western sound when cashed in! Next, a universal system of weighting from -3 to +3 gives game Judges and players the ability to create characters and scenarios by balancing the worth of various special abilities and archetypes (and in 2019, weapons and equipment). 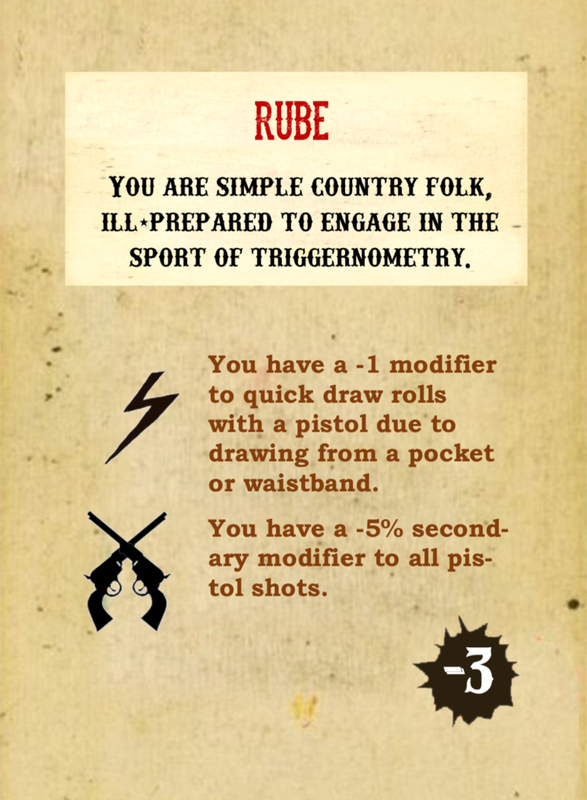 Finally, the defensive reaction system (known as “quickdraws”) allow any character who is attacked from within short pistol range to sacrifice their next card to try and make a defensive snap shot. Players roll-off against one another to see who is the fastest gun hand, and it’s even possible for characters to gun one another down simultaneously! IS THERE AN OVERVIEW VIDEO? WHAT MAKES THE FIGURES UNIQUE? Knuckleduster has paired these rules with their premier digitally-sculpted Gunfighter’s Ball figures and terrain. Each figure is sculpted digitally by Forrest Harris, printed on a jewelry-grade, industry-standard 3D prototyping machine (and Envisiontec Hi-Res), and cast in razor-crisp tin pewter. 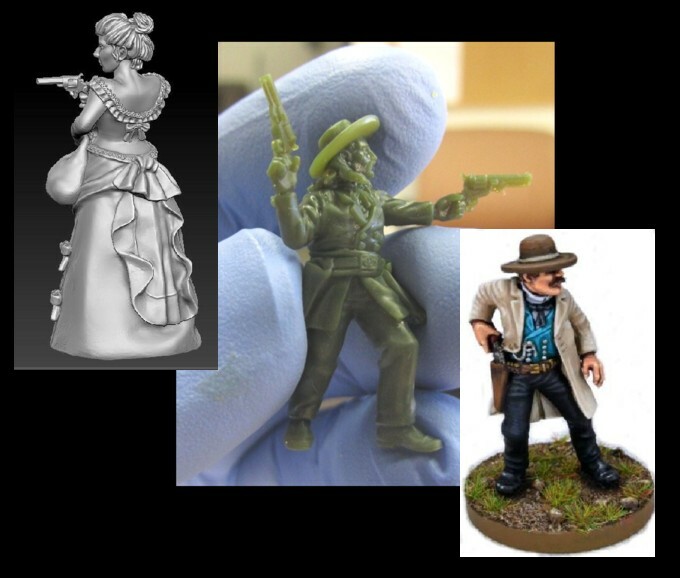 Figures are provided with an MDF base, and a set of 70 character cards is available for all of the figures in production, simultaneously providing stats as well as a color picture of a painted figure to use as a paint guide. IS THERE TERRAIN TO GO WITH THE GAME? 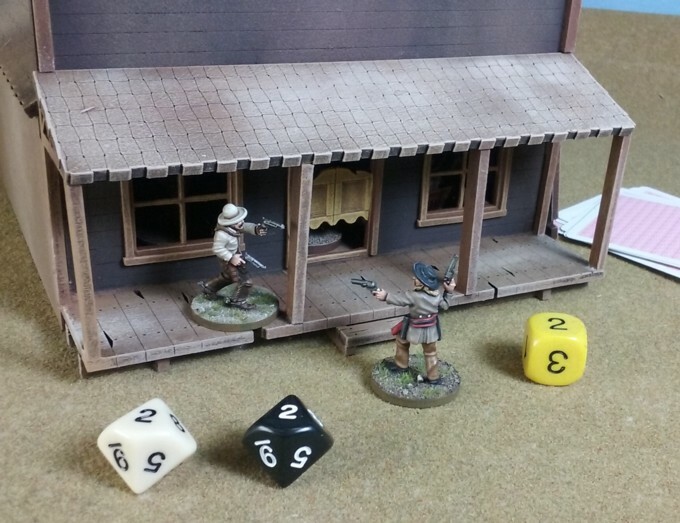 Gunfighter’s Ball MDF and HDF buildings have incorporated cast parts in order to make windows and doors realistic, strong, and easy to install. 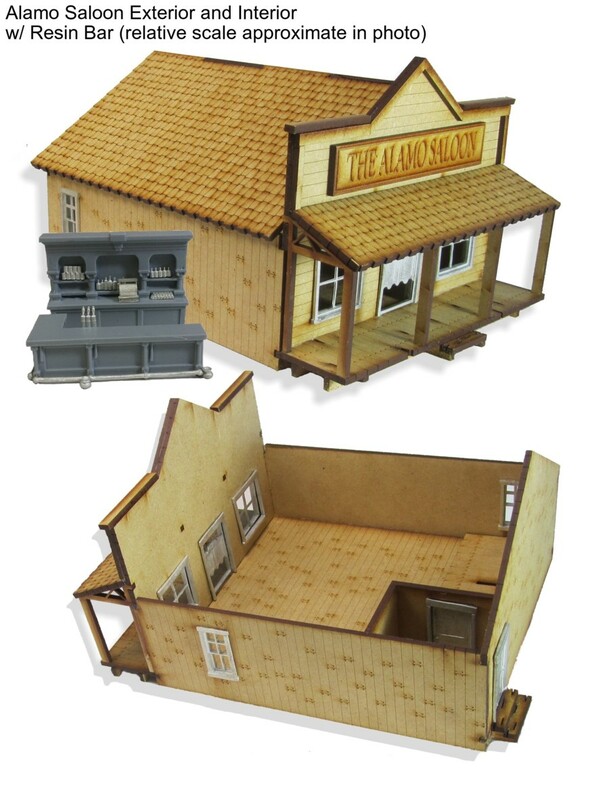 Stores, a blacksmith’s shop, a barbershop, saloons, a jail, a boarding house/hotel, outhouse, fencing, and livery stable are in the current product line (some just being released at the holidays), and many more designs are planned. Some of our buildings on the demo board we take to conventions. This is a typical game layout. You can also see our buildings in the YouTube video linked to earlier. Dozens and dozens of fighters, bystanders, vignettes (such as a pharo game in progress), animals, buildings, and furniture are available at the present time, and Knuckleduster’s usual frantic pace of new releases, which took a break during Kickstarter fulfillment, will resume in earnest after December 15th, with dozens of new items in the pipeline. Join us on Facebook on the Knuckleduster Facebook Page or the Gunfighter’s Ball Facebook Group. Also be sure to check out the links on the right side of this page, and explore the articles contained here on the Gunfighter’s Ball Blog.